© 2017 Texas Children's Hospital. All rights reserved. PFW976_060117 Here for life. There's nothing like bringing a new life into the world. It's a precious gift, and an awesome responsibility. One that begins well before birth. 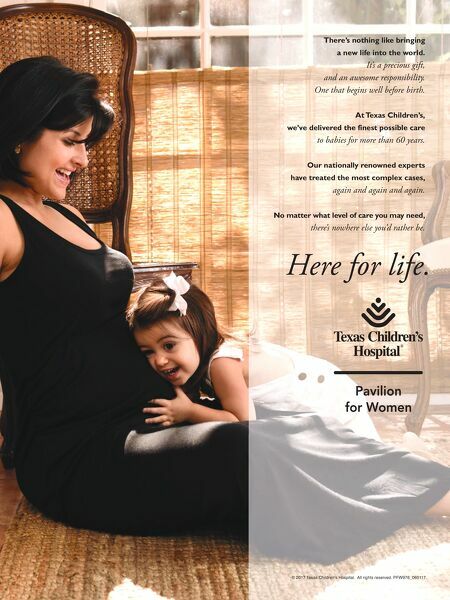 At Texas Children's, we've delivered the finest possible care to babies for more than 60 years. Our nationally renowned experts have treated the most complex cases, again and again and again. No matter what level of care you may need, there's nowhere else you'd rather be.